Do you ever look at the latest fashions and think to yourself that they look great...but they just aren't YOU? They don't fit your personality and just don't look right on YOU. It can be quite frustrating to try to fit in with all the current fashion trends and look your best...only to discover that you really don't look your best. Carol Tuttle felt the same way and sought out to create a new way to look at beauty with the Dressing Your Truth program. So, what is Dressing Your Truth? 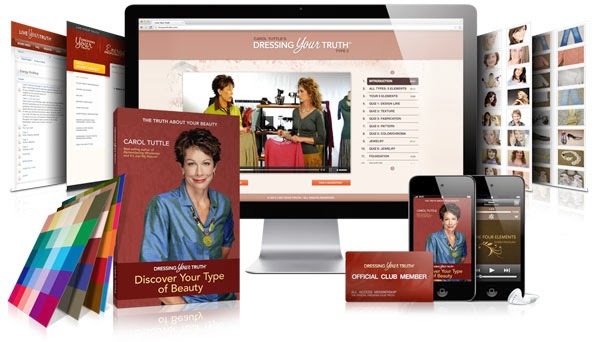 Dressing Your Truth is an educational service designed to teach you about your unique Type of beauty, give you insights and tools to feel more confident and look more beautiful, and provide products that make your shopping experience easy and affordable.This practical, intuitive beauty makeover system empowers you to look and feel your best. Type 1: Air. These are the individuals who are fun-loving, light-hearted, youthful. They tend to be outgoing and animated. Type 2: Water. These individuals are calm, subdued and sensitive. Type 3: Fire. These individuals tend to be very reactive. They are swift, intense, practical and to the point. Type 4: Earth. These individuals are bold, authoritative, regal, simple and reflective. They tend to be the perfectionists. The Dressing Your Truth online course takes you through each of these energy types in detail and helps you to discover what YOUR energy type is. It offers common personality traits, gifts, and even comments that you may hear from others regarding your personality or the way you do things. After completing the course, I discovered that I am a Type 2 energy. For anyone that knows me, that seems pretty accurate. I am very quiet, sensitive and love providing comfort to my loved ones. I don't feel the need to be the center of attention (actually, I hate it!) and am perfectly content to blend into the background. Once you've learned your type, you then learn to dress your type. They go through what colors, fabrics, lines, designs, etc work best on you. As a type 2, I learned that I should be wearing subdued colors, flowing styles and that comfort is key. They even discussed how to apply makeup and style your hair. The lessons in makeup were perhaps my favorite part of the course! I picked up several little tricks that I'd not heard before. And to make it even easier, you can shop the online store designed just for each energy type. I thought it was a very interesting concept and truly enjoyed learning about all the different types. The personality aspects were right on for me, and I did find it interesting that one of the colors that is supposed to be great for MY type is purple- a color I've always felt looked best on me. On the other hand, I also LOVE wearing bright colors and bold necklaces- something certainly far from the recommendations for a type two. However, I also found that I related to many parts of the type one personalities, who WOULD be recommended to wear the bright, youthful colors I love. Still, it was an interesting course that I enjoyed taking and certainly a great starting point for anyone who wants to look their best and doesn't know where to start. Disclosure: I received a complimentary course and gift card in exchange for my honest review. All thoughts are my own, your experience may vary. Do you take a whole course to determine what you should wear?